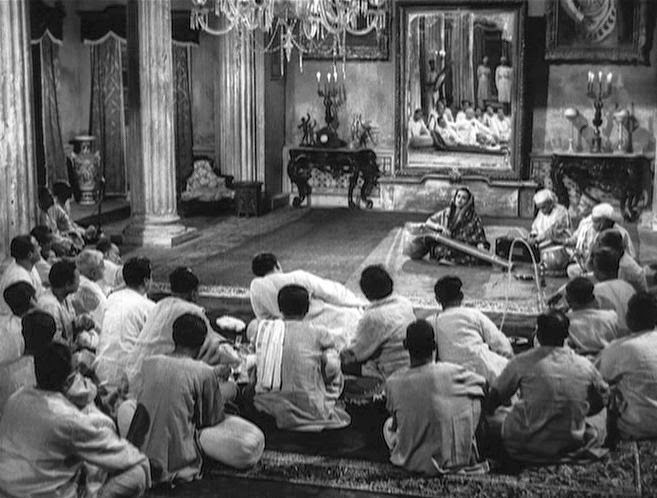 Satyajit Ray’s The Music Room (Jalsaghar, 1958) was rather different from his two earlier and more well-known works, Pather Panchali (1955) and Aparajito (1957). This time, instead of a multi-perspective, naturalistic account, the film focuses on a single character whose aesthetic obsessions isolate him from the world around him. But such structural differences can sometimes be overemphasized and lead us to neglect an important commonality. Here again with The Music Room, as in most of Ray’s work, the narrative landscape has a significant interior dimension to it. The external events depicted lead us deep into the mind(s) of the principle character(s). Such introspection is difficult for the film medium and better suited for printed text, but Ray excelled at this expressive dimension in his films. 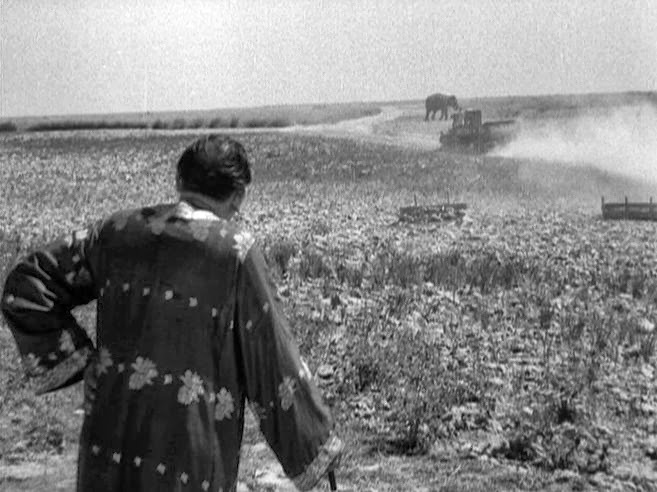 In fact it is this interior aspect that elevates Ray’s films and distinguishes them from the works of Italian NeoRealism, to which genre Ray’s work was initially compared. In the particular case of The Music Room, the most important vehicle for expressing this internal world was music. The story of The Music Room, set in the 1920s, concerns an aging Indian zamindar (feudal landlord) whose royal estate and wealth are disintegrating around him. From an external event perspective his decline is monotonic and relatively uneventful – a relentless downward movement. Instead of external events, however, it is on the interior level of aesthetic consciousness, signaled by the film’s music, that the drama unfolds. 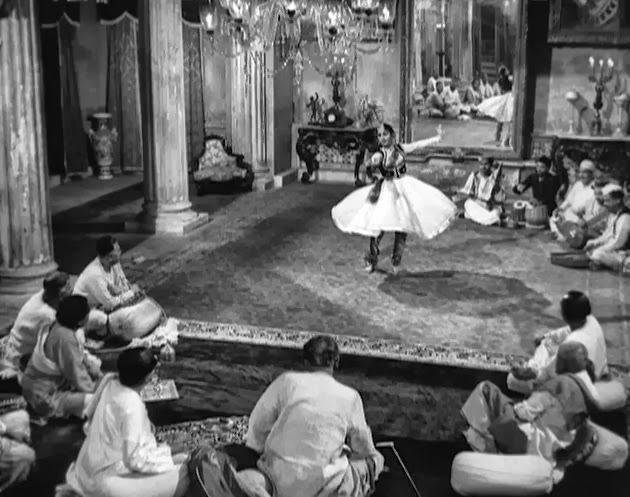 In fact there are three significant musical performances, each lasting 6-10 minutes, in The Music Room that represent dramatic high points on the interior plane for the protagonist zamindar. Of course, music in Indian movies is commonplace, and it has been the general tradition of Indian cinema to have musical numbers interrupt and punctuate the action, taking the audience temporarily out of the story. But in contrast to that style, Ray here used musical numbers as integral diegetic components to the story. And instead of employing Indian popular music, Ray engaged the top-level artists across a spectrum of classical Bengali music. 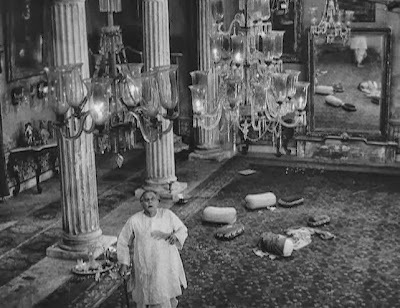 The first scene shows the zamindar Biswambhar Roy half dozing on a couch on the roof of his feudal mansion that is located near the banks of the Padma river . He pauses from puffing on his hookah pipe to ask idly of his servant, Ananta, what month it is. Ananta not only has to tell him the month but also the season, so is the apparent uneventfulness of Roy’s existence. Roy then hears the sounds of a shehnai  from a neighboring villa and asks Ananta about it. Upon hearing that this neighbor is holding the Hindu uponayon, the traditional coming-of-age “sacred thread” ceremony, for his son, Roy closes his eyes and drifts into a flashback reverie that occupies the next forty minutes of the film. Roy recollects a time four years earlier when he conducted a uponayon for his own son. Just prior to this event his newly prosperous neighbor, Mahim Ganguly, came over to his residence seeking permission to engage in property development and contracted money-lending in Roy’s feudal domain. Immediately we see the difference between the two personages. While Roy is regal and polished, Ganguly is an ill-bred and uncouth parvenu. In contrast to the serene hookah-puffing Roy, we see Ganguly nervously taking snuff, smoking cigarettes, and rudely stamping out his butts on the floor of his host’s home. As the story proceeds, it is evident that Roy represents traditional culture and civility, while Ganguly represents modernity in all its unsavory nervousness and energy. Roy has no real interest in the business practicalities that Ganguly talks about – what Roy really cares about is human existence on a higher, aesthetic plane of pure beauty. This is exemplified and demonstrated in the ensuing classical music concert (the first of the three major musical performances in the film), that Roy proudly holds to celebrate his only son’s uponayon ceremony in his elegant manorial music room. The showcased artist on this occasion is a woman singer (Begum Akhtar) who plays on the surbahar before an audience of upper-class gentlemen guests. This was a male-only gathering, because although the performer was a woman, it was not the custom to allow women to attend these concerts in the company of non-relative males. After the concert, Roy retires to his apartment and talks to his wife, Mahamya, and son, Khoka. His wife scolds him for frittering away their dwindling financial resources by holding these lavish concerts and for not attending to the business affairs of his estate. In fact it is revealed that he is simply selling off his wife’s few remaining family jewels (presumably from her dowery) to pay for the top-level musicians hired for the performances. In the hopes of changing her husband’s ways, Mahamya asks him to close up the music room, but Roy is still reveling in the artistic aftermath of the concert and doesn’t even listen to her. She then gets his permission to travel with Khoka by river boat to Naryanpur to visit her ailing father. Though their trip will be during the heavy rainstorm season, Roy doesn’t mind their absence and inattentively gives his consent; he is too preoccupied with his musical reveries. After their departure and while subsequently serenely listening to his privately hosted sitar player (Ustad Wahid Khan), Roy is annoyed to hear raucous noise coming from the neighboring Ganguly residence. He is informed that this is the sound of Ganguly’s newly acquired electric generator, another sign of intrusively advancing modernity. While Roy’s residence is illuminated by a candle-powered chandeliers, Ganguly now has modern electric lights! Ganguly soon comes over to Roy’s residence to invite his lord to a concert he intends to hold to celebrate the opening up of his own new mansion. But though Roy is alarmed to learn that Ganguly’s mansion is outfitted with the latest modern British furnishings, he is relieved to hear that at least Ganguly doesn’t have anything like his own elegant music room, which is emblematic of Roy’s social and cultural eminence. So as an impromptu response to Ganguly’s invitation, Roy tells him that he will be holding a gala concert in his elegant music room on the very day of Ganguly’s scheduled party, thereby causing Ganguly to lose face by forcing him to postpone his own event. Roy’s steward is alarmed at his master’s impetuosity, because hosting this new concert will bring the estate even closer to financial ruin. But Roy is determined to go ahead in order to show his superior class and thereby lord it over that crass upstart, Ganguly; and he further orders that a message be sent to his wife that she must return home with their son to be present for the grand event. This leads us into the second elegant concert performed in Roy’s music room. This time the jalsa (concert) is a Muslim Khyal vocal performance performed by a male singer. On this occasion, though, the elegant musical presentation is clouded by ominous signs. During the performance, Roy is alarmed to see flashes of lightening outside the window, and he is further disturbed when he looks down and sees a large, ugly insect drowning in his wine goblet. The sublime beauty of the music is contaminated by the disquieting and foreboding disorder of the outside world. Sure enough, after the concert Roy learns that his wife and only son have drowned when their ship sank during the storm that he saw outside of his window during the concert. For the shattered Roy, his life is now ruined; and he tells his servants to permanently close up the music room. This ends the flashback part of the film, and we return to the “present” and now understand better why Roy’s life, shown at the film’s outset, is so listless and decadent. Although he still has possession of his mansion, he has by this point lost all his wealth and servants (presumably mostly now possessed by Ganguly), and his music room has been closed since that last fatal concert. Roy gets up from his rooftop couch and decides to go downstairs for once and look at the final remaining vestiges of his past elegance: his last elephant and horse, who to Roy are not objects, but fellow souls with names and personalities. But even here his pleasure is tarnished by his having to watch Ganguly’s modern trucks raising dust as they cruise past his grazing elephant. Ganguly then comes over for another visit to announce that he has just added an elegant music room to his own mansion and will open it by holding a classical music concert. In fact he intends to hire the famous woman performer, Krishnabai (Roshan Kumariv) from Lucknow, the celebrated Kathak dancer. This is just too much for Roy; it is Ganguly’s ultimate act of insolent presumption. Roy tells his last two remaining staff, the steward and the servant, to hire the same Krishnabai for a recital in his own music room the very next day, and to invite everyone to come. This, they all well know, will consume the very last coins of Roy’s once vast fortune. The third concert takes place, and its near ten minutes of screen time are almost mesmerizing. Roy is again revived and alive – not on the practical level, but on ethereal plane that has always been his soul’s home. 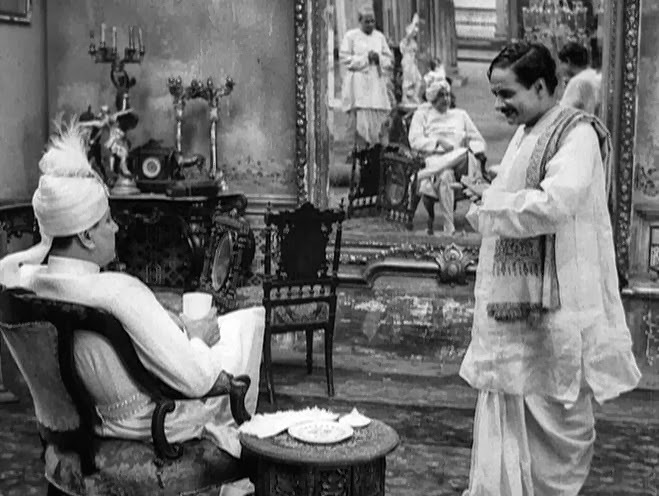 At the finish when the now wealthy Ganguly attempts to present Krishnabai with a gift of coins, Roy peremptorily and regally intervenes and asserts his exclusive right as the host to be the one who makes a ceremonial offering. With this final gesture of elegance, Roy parts with the very last coins from his reserves. After the concert the revivified Roy is now not only inebriated from the wine but also drunk with pride. He has once again trumped his wealthy but lower-class rival and demonstrated the virtues of his bloodlines. As he strolls around the music room, bedecked by portraits of his royal ancestors, he almost crows in triumph. But then he is suddenly panicked by the sight of the music room candles slowly burning out, one by one. This is what inevitably happens to burning candles, and this is what is happening to him, too. His own death is clearly imminent. Everything about The Music Room is stylized, melancholy, and brooding. This film is a long ways from having any affinities with Italian NeoRealism, and it demonstrates the fundamentally introspective aspect of Ray’s cinematic storytelling. For this presentation of an inward-looking soul, however, Ray needed not so much naturalistic innocence, which was intrinsic to the characters of Pather Panchali and Aparajito, but instead a theatrical performer capable of projecting his inner uncertainties. For this he chose the accomplished Indian senior actor Chhabi Biswas to play the role of the zamindar, Biswambhar Roy. 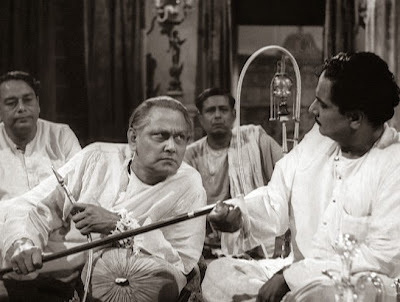 Chhabi Biswas was certainly a veteran performer; this was just one of sixteen film roles that he undertook in 1958. Visually highlighting and accentuating Biswambhar Roy’s inner turmoil is Ray’s dramatic mise-en-scene, which borders here on the expressionistic, with explicit, almost gothic visual motifs and symbols. 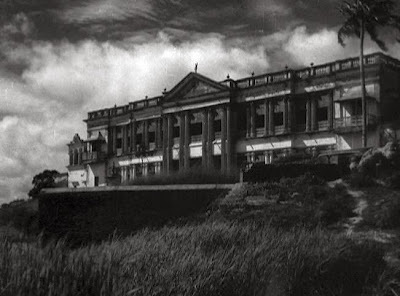 The zamindar’s mansion, itself, is a bleak compelling image of decadent and now petrified majesty. Its cavernous, gloomy interior is accentuated by the numerous extreme high and low-angle camera angles that Ray employs. There are also many recurring shots of the music room’s own symbol of grandeur – its multi-candled chandeliers. And, of course, there are the explicit omens: the struggling insect in Roy’s wine glass and the large black spider that he sees that besmirches his majestic portrait. The film’s music penetrates further into the interior dimension. Ray engaged the finest classical Indian musicians and performers of his day. 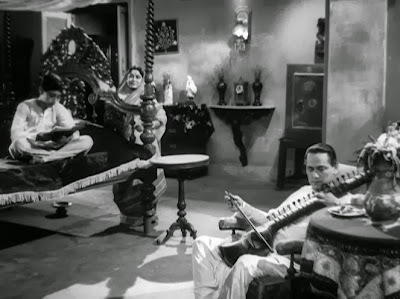 The musical score was composed and performed by Vilayat Khan, a famous sitar player of equal magnitude to Ravi Shankar, who had scored Ray’s two previous films. In addition, there were the onscreen performances of Bismillah Khan (shehnai player), Begum Akhtar (singer), Roshan Kumari (the dancer), and Ustad Waheed Khan (sitar and surbahar player). They create the seductive music that so preoccupies Roy and leads him to neglect everything around him. So is Biswambhar Roy a tragic hero, or is his self-indulgence too extreme to elicit our sympathies? 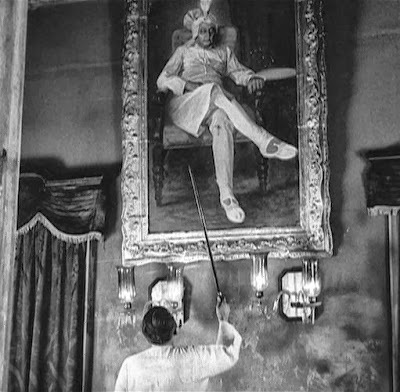 Certainly he represents a decadent aspect of Indian aristocracy that was giving way to modernism. But at the same time, we can understand the zamindar’s reverence for exquisite music and art. Ray, himself, undoubtedly felt the tensions between utilitarian modernism and the aesthetic dimension of the human soul. He came from a cultured background, and he was a highly accomplished artist in many forms – calligraphy (he designed original typefaces), painting, music (he played the piano and composed the scores of many of his films), and writing (he published written works in both essay form and fiction). Certainly Ray gives us the feeling that the tension between art and life is not just a matter of escape from real-world concerns. There is a humanizing aspect of art and music that reminds us of the meaningful moments and interactions that elevate us all. Ray would return to this subject some twenty years later with his The Chess Players (Shatranj Ke Khiladi, 1977). With that later film, however, there was a somewhat different and more subtle theme expressed. In The Music Room, the protagonist is virtually solipsistic – he is happy to self-indulge his artistic desires in complete isolation. But in The Chess Players, where again the aristocratic nabobs fritter away their time in aesthetic diversions, there is at least a recognition that art can be a medium for higher levels of human compassion and engagement. In that film the compulsive art enthusiasts do not triumph, but they do not die, either. They live on, appreciating in the end that the highest form of artistic engagement is loving human interaction. The Padma river is the main distributary (follow-on river) of the Ganges river in Bengal. The shehnai is an oboe-like Indian classical wind instrument, a master of which was Ustad Bismillah Khan, who performed in this film. Jalsaghar aka The Music Room is very close to my heart. It's my favorite Ray film. It took me multiple viewings to appreciate the film fully. I really enjoyed reading your film analysis, as always. Thanks for your comment, Murtaza. I have just read your own review and enjoyed your analysis and observations. I look forward to reading more of your reviews on your site. The best thing I love about the movie is story and cinematography, the movie helps to introduce Indian classical music to world. Indeed it indicates the future of classical music of India somewhere. It is tasteworthyt movie indeed. One of best movie by multi talented Ray.